When Good Bloggers Do Bad - Wylie & Co. 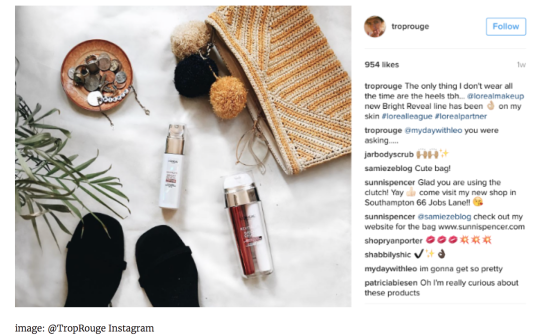 Recently, beauty brand L’Oreal, announced that 15 digital influencers would take part in their year long program called the “L’Oréal League.” The influencers will create content and promote L’Oréal across their social channels. To take part in this program, the brand is paying influencers anywhere from $40,000 to more than $100,000, depending on reach and engagement. I’ve been blogging for more than 6 years. One of the first things that you learn is the importance of disclosing any sponsored work in accordance with the Federal Trade Commission (“FTC”) Act, which in its most basic definition, that you have to let readers know through “clear and conspicuous disclosure” that you are getting paid to post on your blog or social media channels. It’s as simple as using “#Ad”, “Ad:”, or “Sponsored” at the beginning and/or end of your posts. It lets people know that you are posting advertisements for the brand. Sometimes brands (and bloggers) try to get sneaky with these disclosures. They will use disclosures like “#Sp” or “Spon,” hoping to sneak by those pesky FTC requirements so their readers may not recognize that they are paying or being paid for their work. The FTC doesn’t like sneaky. Those kinds of disclosure can be deemed as an improper disclosure because it’s not clear to consumers and they aren’t able to differentiate advertising from other content. And that’s exactly what L’Oreal and some of the digital influencers did. These bloggers used inconspicuous disclosures like “#LOrealPartner” and “#lorealleague” instead of proper disclosures. Consumers are not stupid. Most people can figure out the difference between sponsored and not sponsored content. They see it enough to know. Most people also know that if a blogger is working with a brand, they’re getting paid for it. So why would a big brand and bloggers take such a chance? I’ll be curious to see how the rest of this plays and what the brand and bloggers have to say. Written by Natalie Hoage, Brand Manager for Wylie & Co.
Get our monthly newsletter about Digital Strategy for Premium Brands.